^ Latest Published Data. Minor Planet Center. International Astronomical Union. [January 4, 2019]. ^ 2.0 2.1 李竞. 小行星世界中的古典音乐. 中国科技术语. 2018, 20 (3): 66–75 [2018-09-21]. doi:10.3969/j.issn.1673-8578.2018.03.015. ^ MPC Archive Statistics. 小行星中心. 2015年10月29日 [2013年2月9日] （英语）. ^ Elvis, Martin. 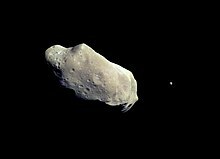 How Many Ore-Bearing Asteroids?. Planetary and Space Science. 2013-12-01. doi:10.1016/j.pss.2013.11.008.